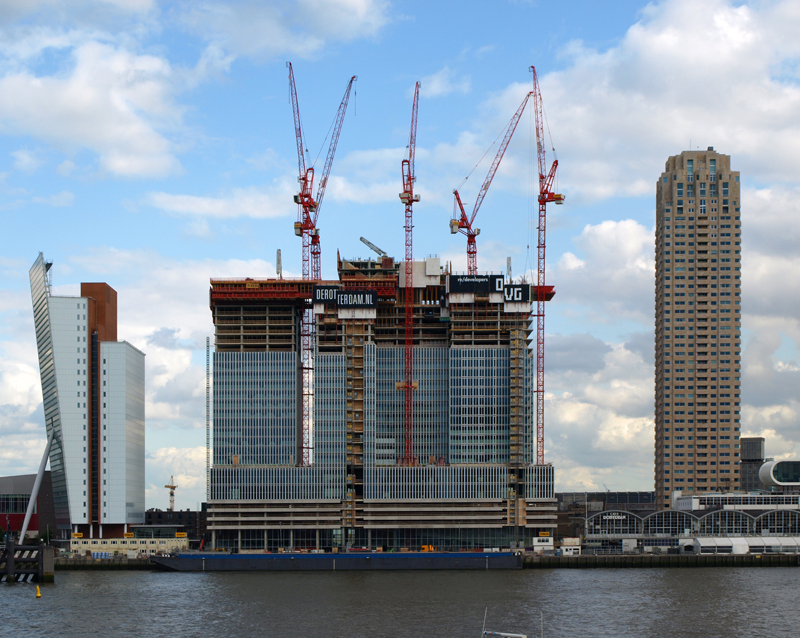 De Rotterdam is conceived as a vertical city: three interconnected mixed-use towers accommodating offices, apartments, a hotel, conference facilities, shops, restaurants, and cafes. 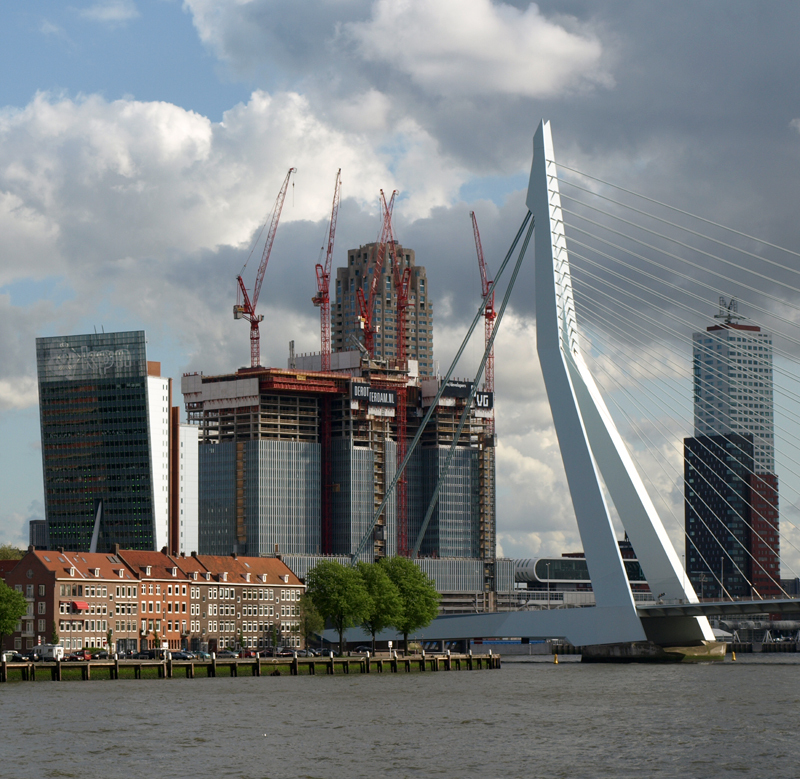 The towers are part of the ongoing redevelopment of the old harbor district of Wilhelminapier, next to the Erasmus Bridge, and aim to reinstate the vibrant urban activity – trade, transport, leisure – once familiar to the neighborhood. 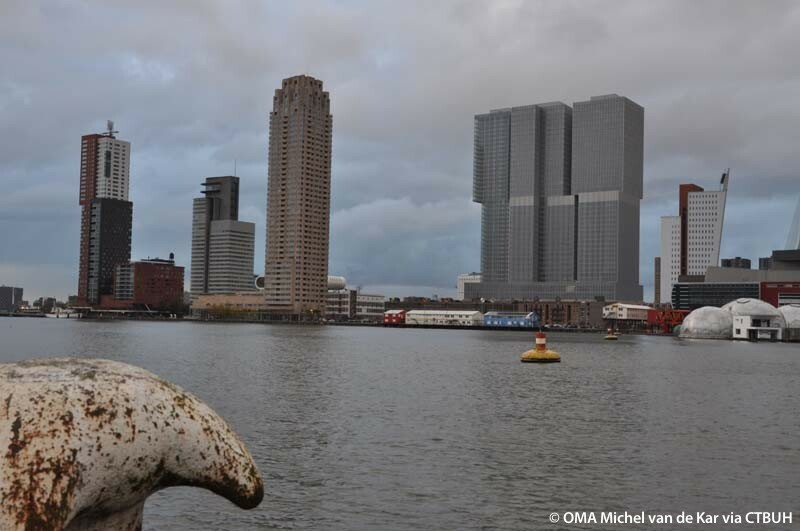 De Rotterdam is named after one of the ships on the Holland America Line, which departed from the Wilhelminapier in decades past, carrying thousands of Europeans emigrating to the US. 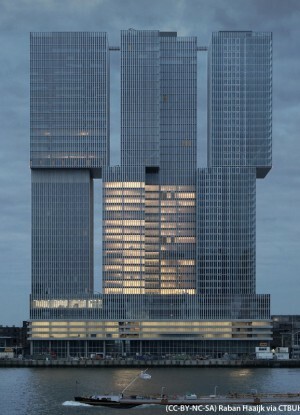 De Rotterdam consists of three connected towers that appear as stacked and shifted volumes upon a base plinth. 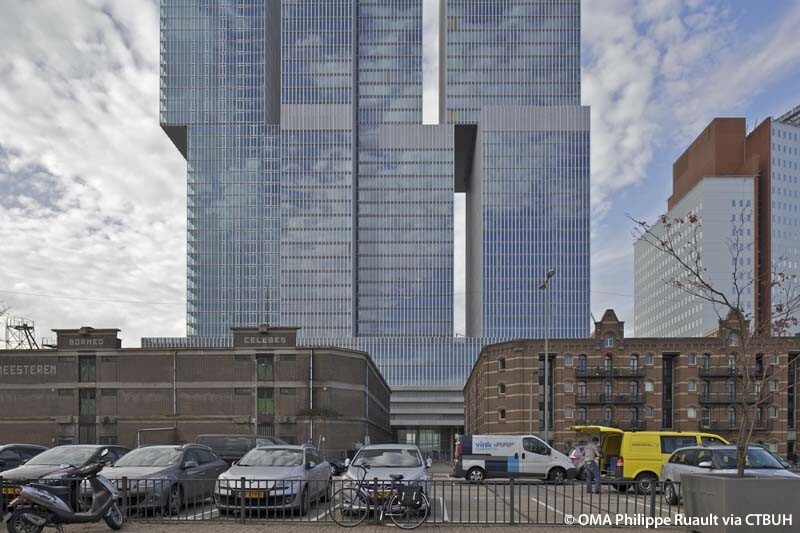 The façade design has been kept neutral and transparent; the dynamic appearance of the building is determined by the varied day cycles of the different programs. 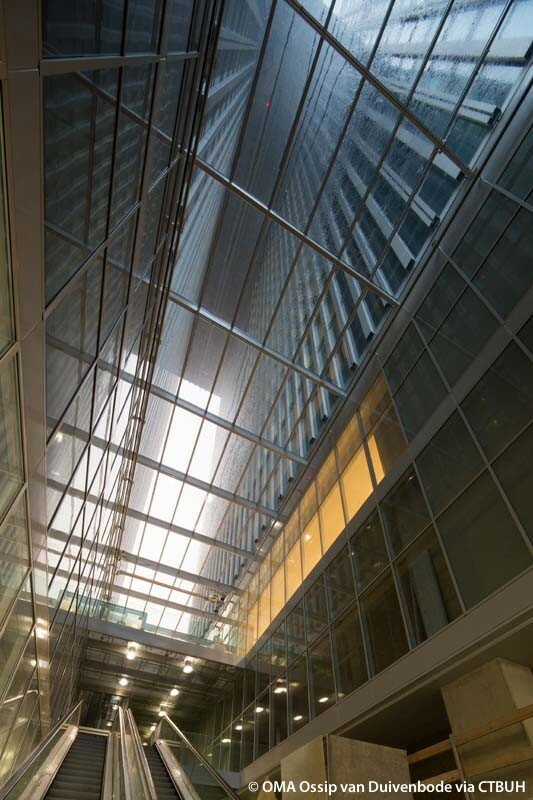 The deep mullions allow the glazed facades to appear more open or closed, depending on the perspective. 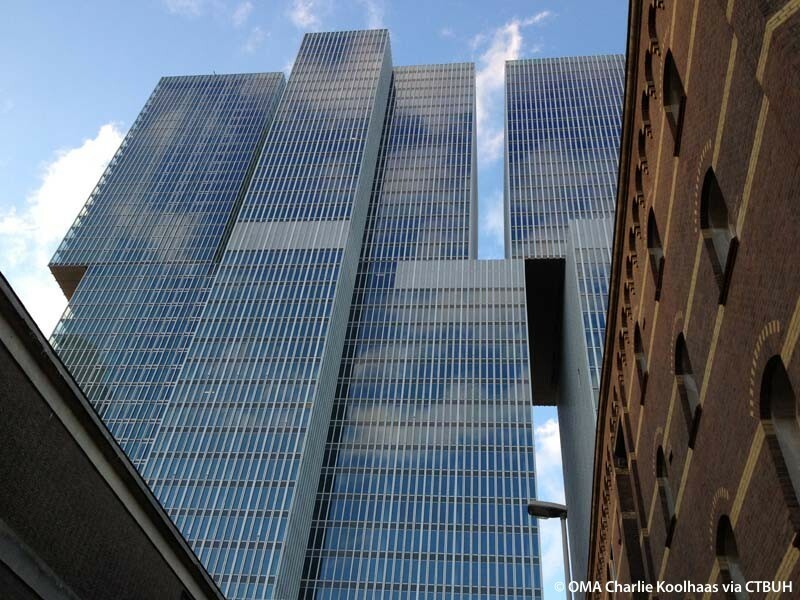 De Rotterdam is an exercise in formal interpretation that is at once reminiscent of an imported mid-century American skyscraper, but epitomizes the off-center experimentalism of modern Dutch art of the foregoing century. 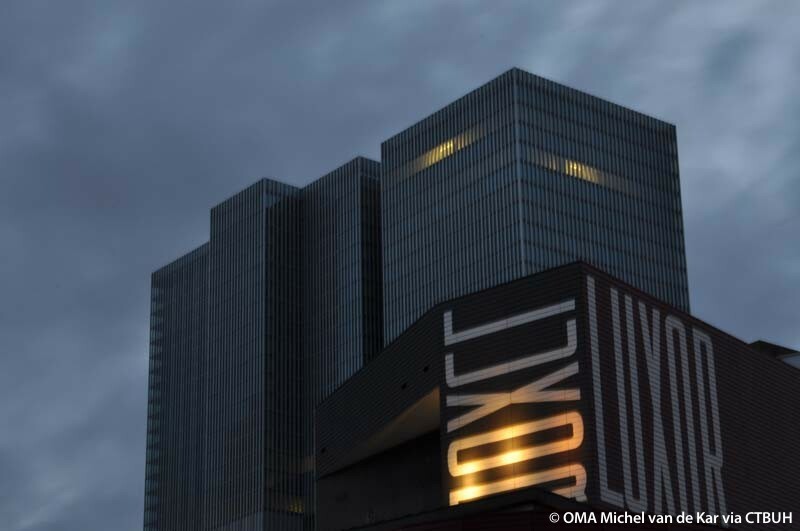 The nighttime twinkling of the lights indicating different programs throughout the day lends dynamism and contributes to the humanization of the monoliths. It is as if the moai of Easter Island were constantly craning their necks and raising their eyebrows at the change all around. At ground floor level, a ceiling height of 8.5 meters ensures a smooth transition between exterior and interior, while loading areas are kept, as much as possible, to other levels. The street-side entrance zone is separated from the waterfront restaurant zone by only a relatively small core, and a large central lobby ensures that a visual connection between street and waterfront remains. 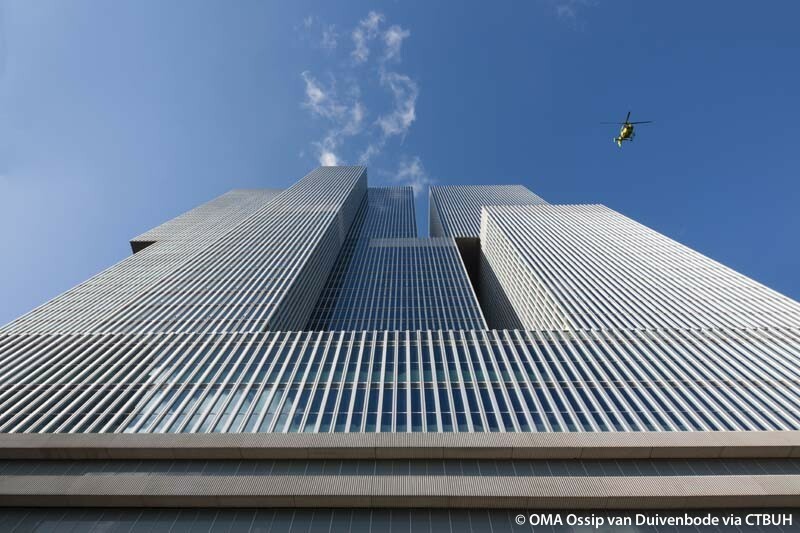 The public program on the upper floors of the plinth meets the ground floor in a large atrium; this void extends externally between the low-rise tower volumes to 85 meters’ height. 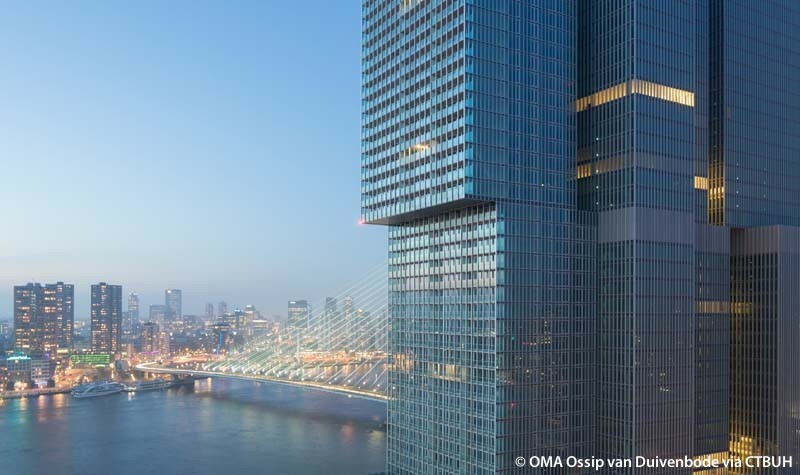 Once within the towers, views between the hotel, office and residential volumes continue the theme of transparency. 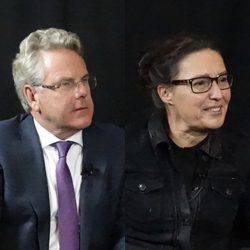 The architectural concept produces more than sheer size: urban density and diversity – both in the program and the form – are the guiding principles of the project. De Rotterdam’s stacked towers are arranged in a subtly irregular cluster that refuses to resolve into a singular form, and produces intriguing new views from different perspectives. Similarly, the definition of the building changes according to its multiple uses internally. The various programs of this urban complex are organized into distinct blocks, providing both clarity and synergy: residents and office workers alike can use the fitness facilities, restaurants, and conference rooms of the hotel. 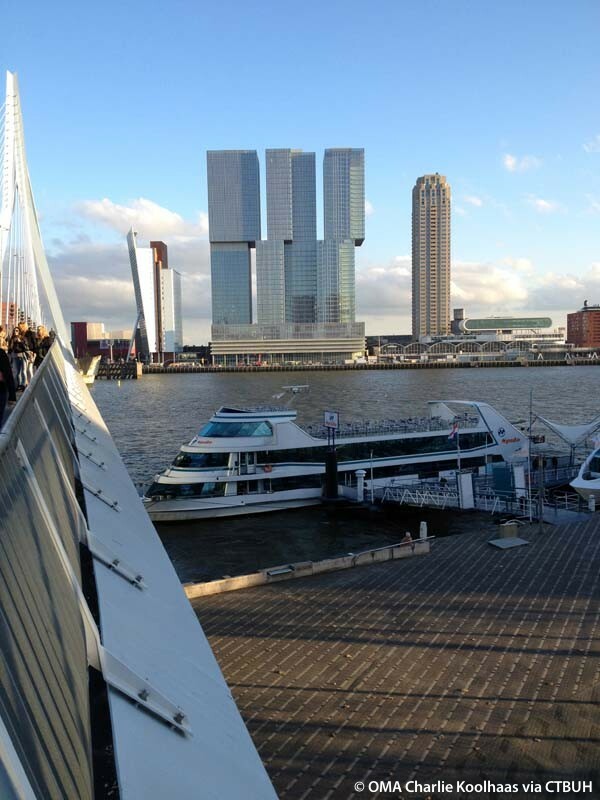 These private users of the building have contact with the general public on the ground floor, with its waterfront cafes. 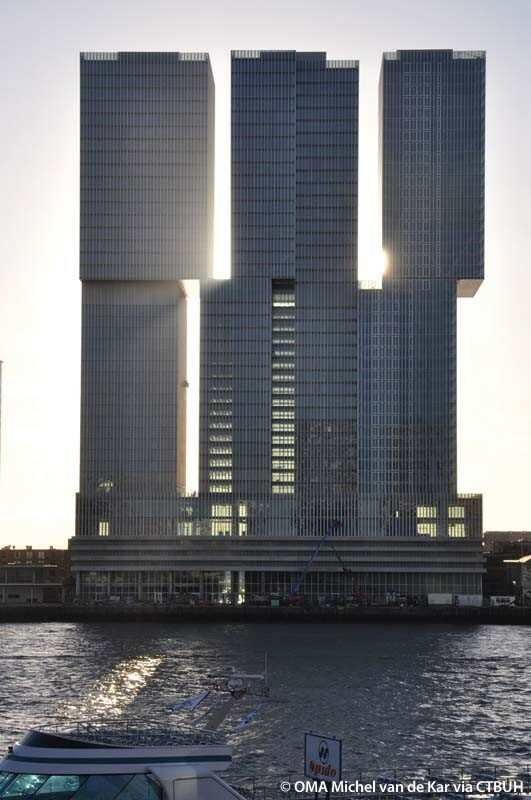 The lobbies for the offices, hotel, and apartments are located in the plinth – a long elevated hall that serves as a general traffic hub for De Rotterdam's wide variety of users. 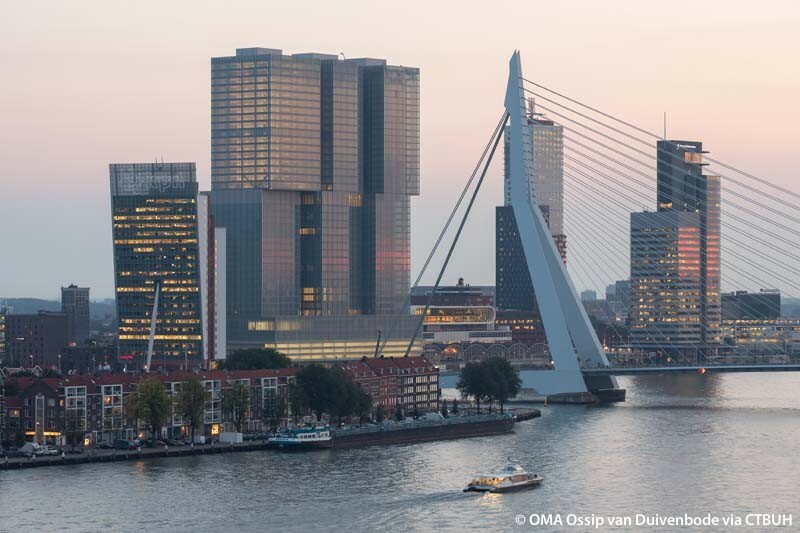 Comprehensive building management, including an energy monitoring system, has been employed to ensure maximum efficiency throughout De Rotterdam. For the purpose of energy supply, a collective generation system was developed, which feeds all the functions in the building. 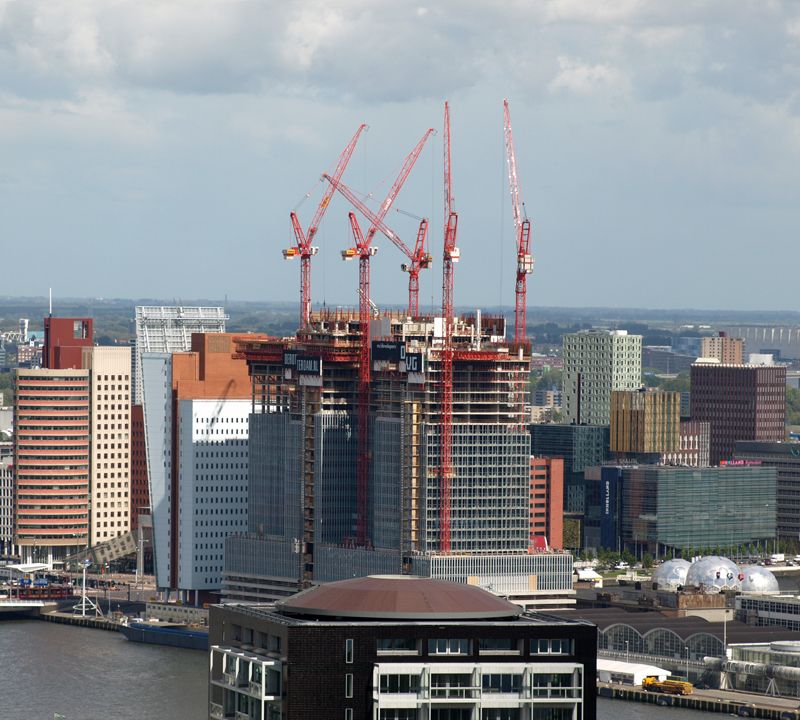 Power is generated via district heating and co-generation with biofuel, while water from the adjacent Maas river is used for cooling. The temperature system additionally uses low-temperature heating and high-temperature cooling, heat exchangers for heat recovery ventilation, and fan speed to control air handing. 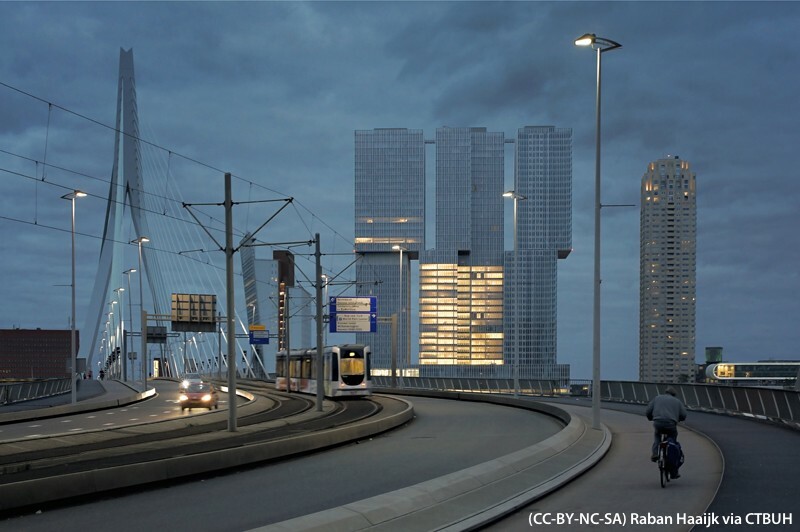 Maximum use of daylight is supplemented by efficient artificial lighting, using high-efficiency reflectors. Appropriate lighting methods have been selected for the various functions, with automatic daylight and motion control in the office areas, and LEDs in the public zones. Sustainability is further improved with water saving taps and reservoirs, and efficient elevators using energy recovery.